This hanging banner is ideal for trade show events as well as in store retail displays. These banners are large and hang high above your exhibit to ensure your brand will not be missed in the crowd. 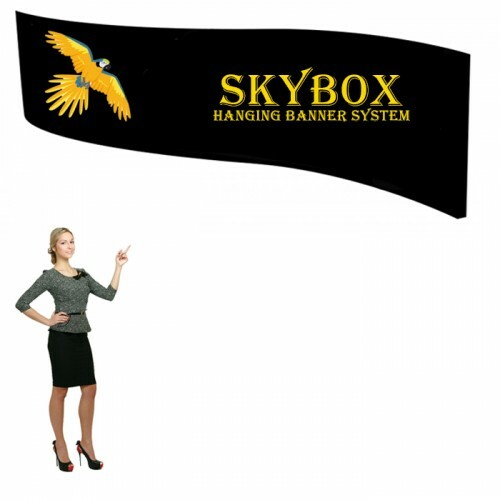 This wave shaped sky box is produced from high quality stretch fabric with vibrant full color printing. The skybox pillowcase graphic fits snugly over the tubular frame. Available in round, square, and triangle configurations as well as numerous sizes, there is a Skybox Hanging Banner that will suit almost any situation. This overhead banner is 14 feet wide in diameter and 5 feet tall. About Hanging Graphics: We print your Skybox on pillowcase stretch fabric material. The graphic is hemmed with a zipper and has finishing at the top for hanging up. The Skybox's are printed with dye sublimation. For single sided hanging banners we offer a white or black backer. For double sided hanging banners both sides can be customized.